I started writing what was going to be one blog post and I decided to write it all out. 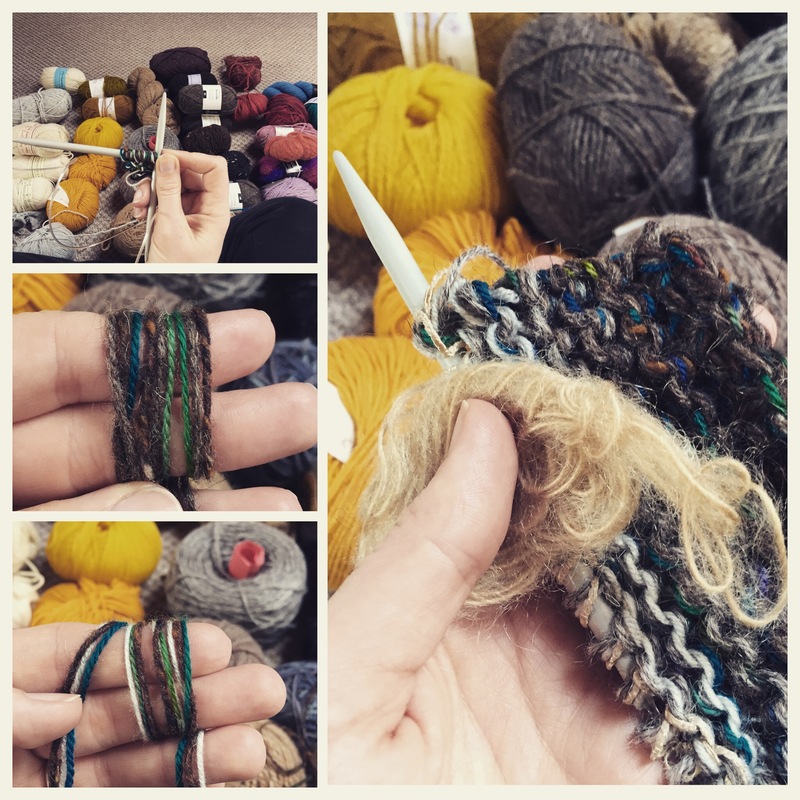 So this is part 3, wherein I warn the gentle reader if they are about to start on their YarnKonMari project. You can read Part 1 or Part 2 of this epic cull. I planned this originally thinking I had time off in April for Easter, but I have to go on a sad trip. So I had to wrap things up quickly last weekend. As I mentioned in the previous post, I wanted to photograph the yarn and I thought I’d queue it (ha no!) And even on the day, I tacked BOTH books and yarn. Don’t do what I did. Start KonMari early in one category. I wish I’d had the whole weekend, but I was booked. I think it’s really helpful to hear people TALK about organizing and decluttering while I organize. Tackling the stash, Curious Handmade. And a special Google Talk by Marie Kondo. I think in the end I have a KonMarieFail. I did eliminate a good bit of yarn, but I feel like I just pushed stuff between boxes. I certainly know better what I have now, but I didn’t even get photographs as I had planned. I think KonMarie says you should start with a vision of the lifestyle you want so you can work towards it. I do want a lively, big, fun stash. But do I want it all out in the open exposed to dust/air? I think if I maintained a small stash then it would be easier to keep out on the open and enjoy it. I don’t think I looked into how people store and display yarn. And that is why everything pretty much just ended up in boxes again. I think if you have a vision, you also know when you’re successful. After clearly eliminating the joyless yarn, I looked at the rest, and decided to sort it further. I had a “Hall of Fame” of yarns; I had “spark joy” yarns and I had this whole pile of “moderate joy” yarns. I sat down with this moderately joyful pile, and organized it by colour. I woke it all up. I found I was surprised by the sparkly joy that the scraps and leftover yarn bits had. Suddenly they seemed like some exciting materials to play with freely without fearing using up too-precious yarns. I decided to combine 2 neutral with one pop of colour, and use up some bits with texture. But my husband caught me and we had a discussion about the whole project. It was clear I wasn’t making progress. Of course, first I finished and cast off the swatch. Then returned to business. This might be the yarn equivalent to reading a book while you’re doing konmarie on your books. I really should not have started knitting! I love the swatch though and I think this would be a really fun project. I can picture it in a jacket: which would like being thick and heavy. I love Stephen West’s Marled Madness coat. Though I didn’t start out with a vision, I started to develop one. I would like to achieve a state of active, live, exciting stash. Clara Parkes calls this “slow stashing“, which I mentioned in the previous post. 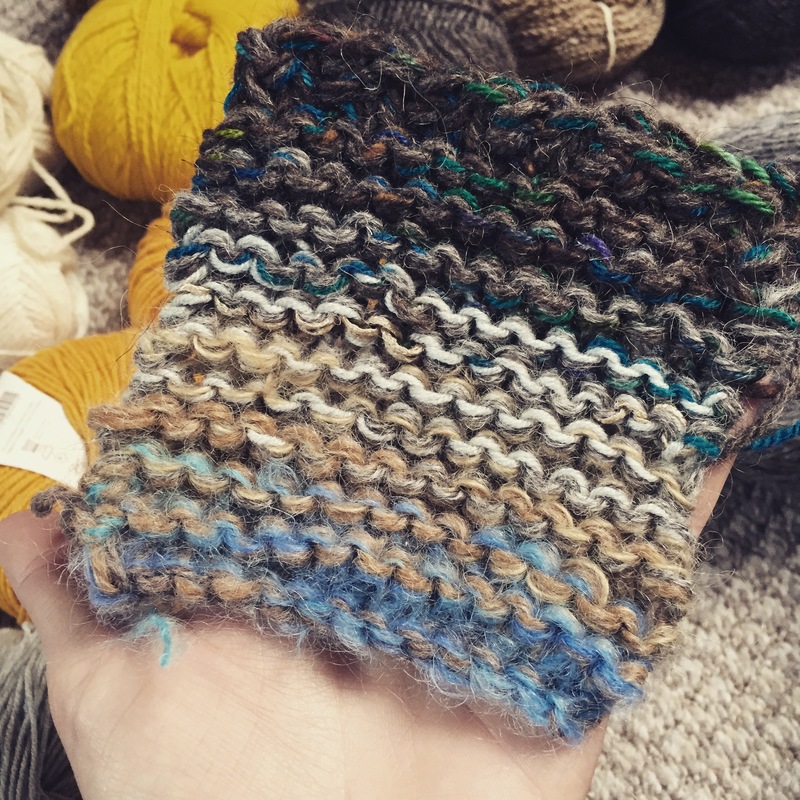 “At its core, slow stashing involves being mindful of every skein we own, and only bringing in new skeins that are truly deserving of our time, our attention, and our resources. I think in terms shaking up the stash and getting familiar with what’s in there, I know what I have now. But the problem is, will I remember? 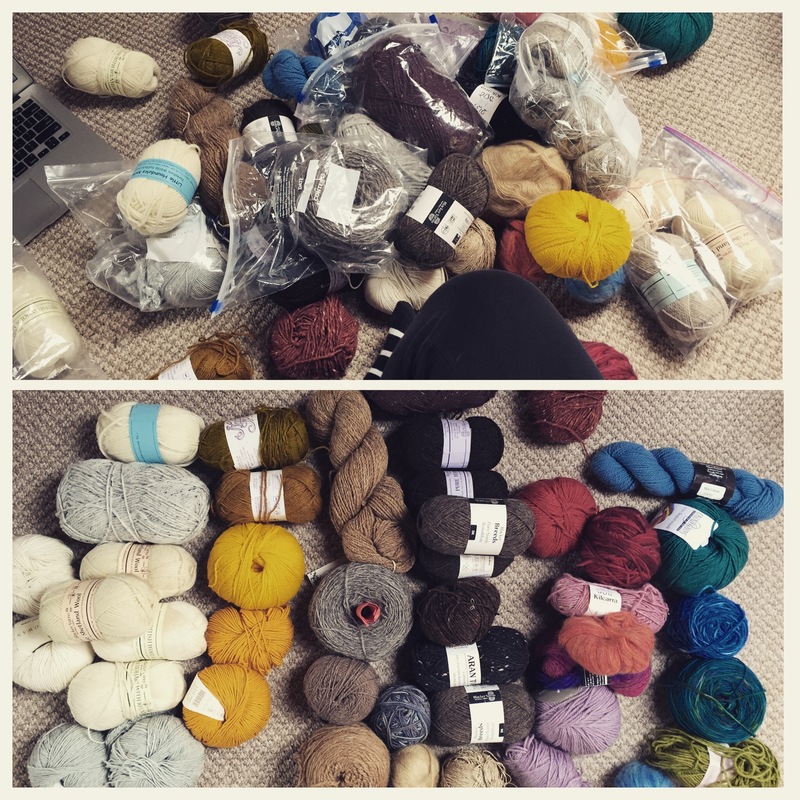 I really like Hanna Fettig’s advice about organizing your stash. TIP FOUR. Take a a few hours to organize your materials in a pleasing manner. I’m not a big fan of storing things in ziplock bags inside plastic bins. I like to have everything out, sorted by color or coordinates, so it can inspire me on a day to day basis. I shuffle everything around from time to time to give me a fresh perspective. I have put the yarn back in plastic bins because that is what makes sense for the amount of stuff I have in relation to the space. 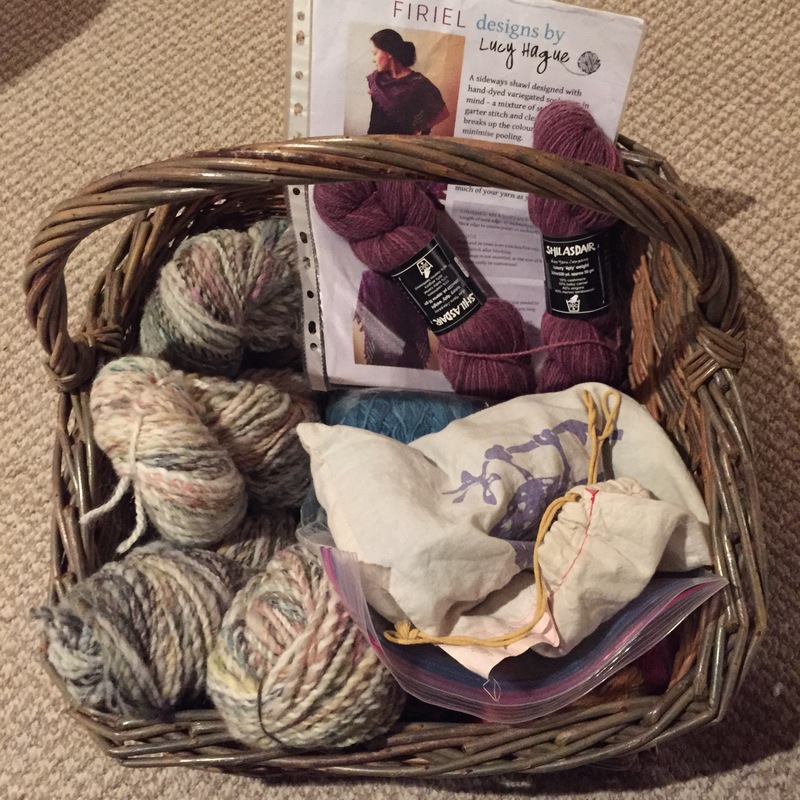 However I have pulled out current projects into a basket so I can see what I’m working on. A spinning project and a few WIPs. What I should do is take out yarns from time to time so I can just enjoy them, play and wake them up. And I still have fibre to sort through! I loving following your KonMarie journey here. Best of luck with your other journey. Thanks, Cathy. It’s been a spring of upheaval. Probably not the best time to stage a clear out! But it’s making me feel lighter in a way. The stash feature on Rav is really the only way I can keep track of what I have. Once you get it all in there it’s SO helpful.